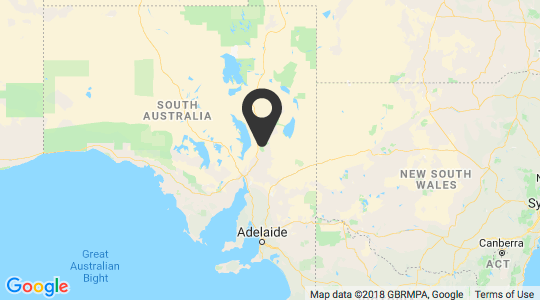 Where is Wilpena Pound Resort? 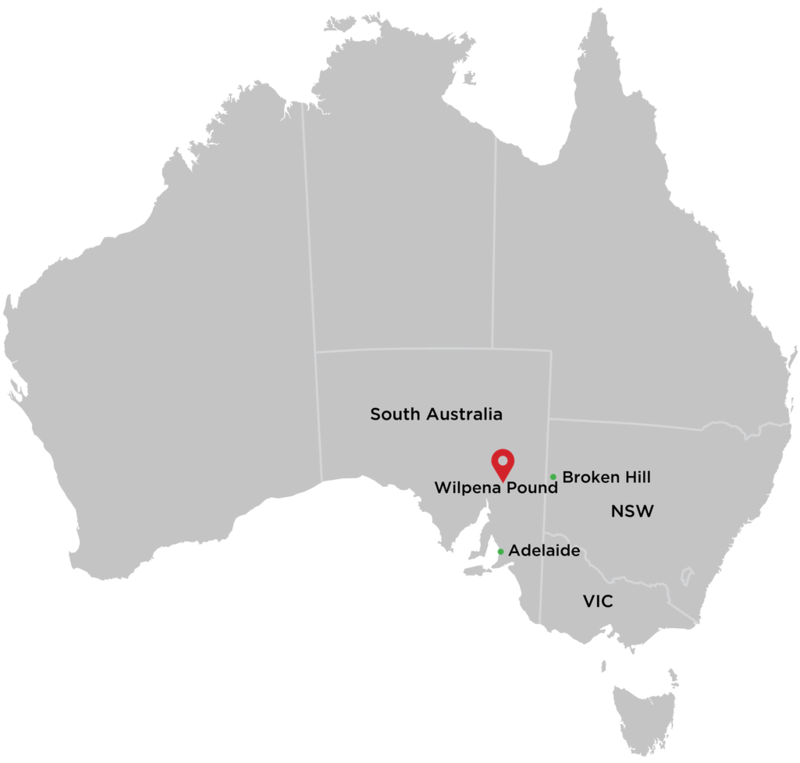 Wilpena Pound Resort is located in the Ikara Flinders Ranges National Park, South Australia (429 kilometres north of Adelaide). It is accessible by sealed roads from Adelaide and Port Augusta, or via a Scenic Flight Transfer. 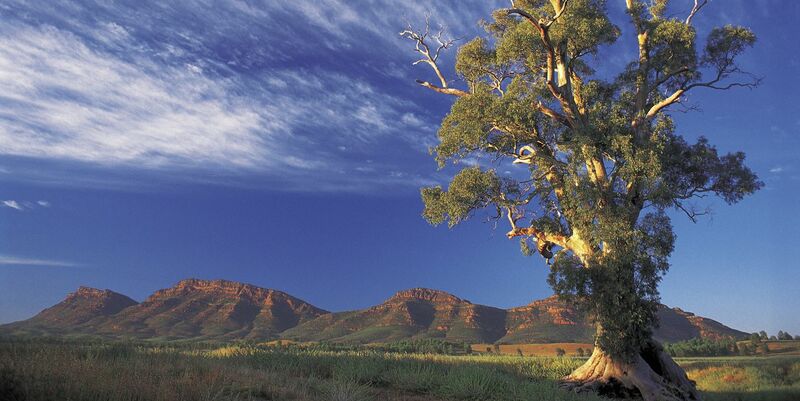 The Flinders Ranges National Park encompasses some of the most spectacular scenery in South Australia, made famous by the paintings of Sir Hans Heysen. The Park is world-renowned for its geological history and includes impressive fossil remains. Adnyamathanha people have lived in the Flinders Ranges for tens of thousands of years and the region remains of enormous significance today in contemporary Adnyamathanha society. European occupation of the Flinders Ranges in the mid-nineteenth century brought widespread environmental modifications. Despite these changes, the Park supports examples of natural and semi-arid ecosystems, and includes many plants and animals of conservation significance. The most notable of these is probably the yellow-footed rock wallaby which can be found in rocky gorges within the Park. Regular air services operate to Port Augusta (160km away). Other small private airstrips are also available by arrangement only. Transfers can be organised with the resort prior to arrival. The Indian Pacific and The Ghan rail services also operate through Port Augusta on a regular basis. AAT Kings - Operates a 15 day guided tour from Adelaide, through the Red Centre and to Darwin. Other outback itineraries also available. Australian Iconic Tours - offering 3 Day and 7 Day Flinders Ranges Tours and Private Charters from Adelaide for groups of any size. Australian Pacific Touring - operates a 6 day 4-wheel drive tour which travels beyond Wilpena Pound Resort up to Lake Eyre. Flinders Experience 4WD Tours - Experience the Flinders Ranges with a unique, unforgettable and exhilarating 4WD tour, with a locally based Flinders Ranges specialist operator. Fun Over 50 - Award winning tour specialists operating deluxe tours focussed on fun and entertainment for over 50's. Just Cruisin offer personalised and small group adventure 4WD tours throughout South Australia. Choose from 2, 3 and 4 day tours staying at Wilpena Pound Resort. Outback Spirit operates a 15 day itinerary combining the Flinders Ranges and Kangaroo Island. They stay with us at Wilpena Pound Resort for 2 nights. They also operate a popular 6 day tour including Wilpena Pound Resort and beyond to Lake Eyre. Scenic Tours - Their 2016, 11 day Taste of South Australia tour includes Barossa Valley, Wilpena Pound and Kangaroo Island and is highly popular. 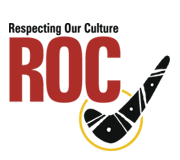 SA EcoTours - SA Eco Tours offer escorted 4WD tours of teh Flinders Ranges and up to Lake Eyre, Coober Pedy, and also along the Yorke Peninsular.